Over the next few days increasingly warm and humid air moving up from the continent will see UK temperatures on the rise, with the warmest days of the year so far expected. Temperatures in the south east of the country could climb to the low 30s Celsius by Friday, while other parts of England and Wales are likely to see temperatures in the mid to high 20s. These very warm conditions will be accompanied by a close and humid feel in the air, which could make it feel quite uncomfortably warm in places – particularly during the nights. While there is a good deal of dry and fine weather in the next few days, there is also the chance of seeing some heavy rain and thunderstorms as we go into the weekend. Friday may see an area of thundery showers moving north east across parts of England and Wales. Our meteorologists are also keeping a very close eye on the potential for more widespread thundery downpours on Saturday. These could develop from what meteorologists call a ‘Spanish Plume’, which is a catchy name for a rather complex set of conditions. It involves very warm and humid air moving up from the Spanish plateau to the UK. If this meets cooler air from the Atlantic, the warm air can be forced rapidly upwards to produce thunderstorms. There are a number of ingredients that all have to come in to place for this to happen, however, so the risk of disruption from any heavy, thundery downpours is low for Saturday at the moment rather than a certainty. A yellow alert has been issued for this risk and will be updated in the coming days. You can keep up to date with how this situation develops by checking our forecasts and warnings over the next few days. Interestingly, the warm weather we’re expecting can be traced back to the jet stream, a narrow band of fast moving winds high up in the atmosphere which forms where cooler air from the polar region meets warmer air from the tropics. The jet stream has dipped south over north eastern parts of the US, allowing cooler air to flood in over the area and bringing much lower temperatures than usual for this time of year. Top image shows forecast jet stream at 1am Wednesday, with an obvious kink over the NE of the US. The bottom forecast image, for 1am on Saturday, shows a kink now over Spain, with warm air from that region flowing towards the UK. 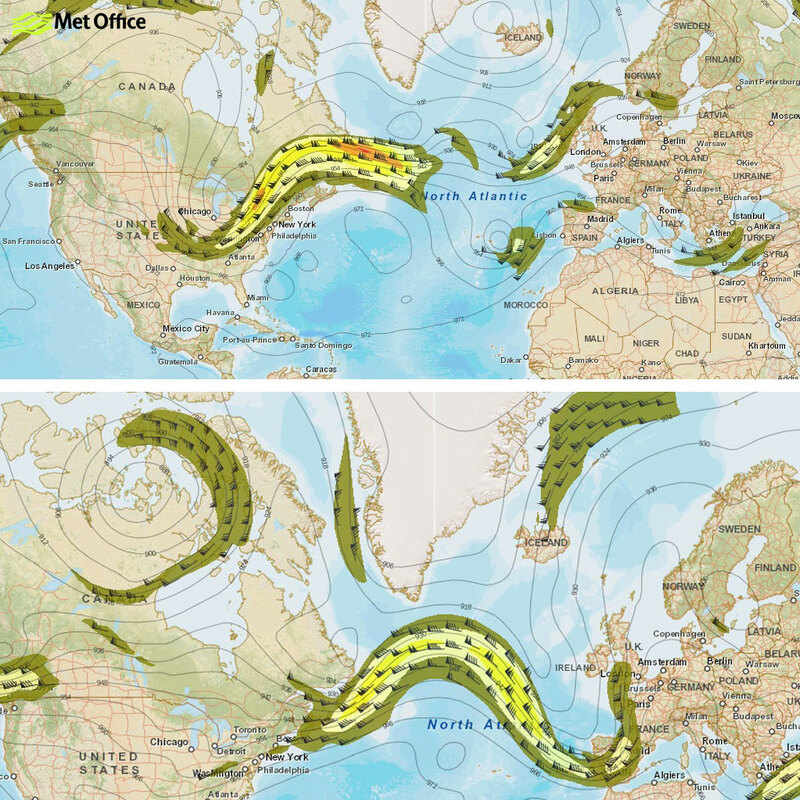 This kink in the jet stream causes a knock-on effect which pushes the cooler air south across the Atlantic, which in turn pushes the warm humid air over the continent (around Spain) towards the UK later this week. This provides yet further proof of the way in which all weather is connected, but there are no hard and fast rules as to how events in one part of the world will affect us here in the UK. This entry was posted in Met Office News and tagged Lightning, Met Office, plume, spanish, spanish plume, thunder, Thunderstorm, thunderstorms, UK, weather. Bookmark the permalink. 2 Responses to With hot and humid weather could we see a ‘Spanish Plume’?